Book Blitz, Excerpt & Giveaway!! 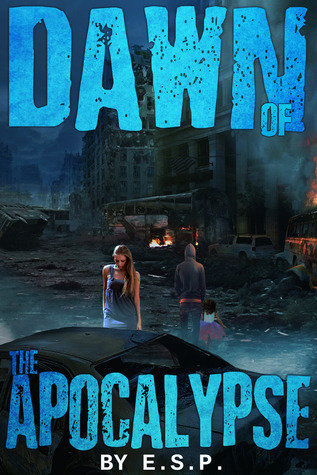 Dawn Of The Apocalypse by E.S.P. It was the kind overtaking Cliff’s chest right now. He was aware he was conscious and in the back of his head, he knew it was probably an intelligent idea to get some air into his lungs. But for some reason, he couldn’t make his body arise from the sweet peacefulness that was the interface between consciousness and unconsciousness, a cross between life and death. In his mind, he saw the smoke like a dark heavy being looming over him and slowly wrapping its charcoal hands around his neck. It was squeezing and squeezing until his words were a voiceless symphony and his body became limp and silent. Cliff didn’t know why, but he was okay with that. He was aware of the sound of something crackling, like twigs being stepped on or a wrapper crumpled in the hand. And then the sound of people screaming—screaming for help, screaming other people’s names. Screaming for God to save them. There was another person’s voice that was a lot closer to him, almost right in front of him. It was light and sweet and feminine. It sounded desperate, pleading. Oh how he wanted to see whose voice that belonged to. But it was so far away and his eyes were so heavy. He was so very, very tired. He wanted to sleep forever. "Please wake up. Please." The voice was saying. "You have to get up. Please get up." Inside he wanted to say, "I want to get up, I do, I just can’t, I need help." But his throat was so dry and a large wave of suffocating heat was pressing down on him, crushing his bones into ashes. He felt his spinning mind slow down, his heart beating erratically. And then were cool lips on his and cold air rushed into his mouth, through his body and into his mind, telling him it was time to get up. He felt his arms being held and slowly pulled, and he didn’t fight it. But he could do nothing to aid in the quest to pull his body up. His back felt like it had been ran over with a steam roller. It cried out in pain and he wanted to return to the ground and let smoke cradle him as his heart slowed to invisible beats. His legs felt like they'd been drained of blood. Pins and needles burned at his thighs. His legs gave way. The arms hoisting him up prevented his crash to the ground. Cliff tried again, extending his legs to their full potential as he began to pick his feet up one at a time, advancing towards wherever the freshest air was. He opened his eyes, but found that it made no difference. All that hung in front of him was thick blankets of smoke. He could hear the fire crackling in the background. He knew the fire wouldn’t be as much of a peaceful death as the smoke. He would burn from the inside and out. The fire would beat him senseless than mercilessly eat up his body until it was unrecognizable dust. And Cliff wasn’t in the mood for that at the moment. The arms were still supporting him as they made their way though the room of darkness. He kept fresh air on his mind to motivate him to keep going. Because as of right now, smoke and oxygen were having a fight inside his lungs. And the smoke was winning. A burst of light flashed past him as a spark fell from the ceiling. "Okay, a little faster now," the voice urged forcefully, as the spark grew into a flame. Cliff’s eyes focused on the space in front of him. Were those big glowing green eyes in the smoke? Being the daughter of an accomplished author, E.S.P. grew up listening to stories and telling her own to classmates. After writing for several years and even publishing some short works, she finally decided to take the plunge to write (plus finish! )a full length novel. Thus, Dawn of the Apocalypse was born. When she's not writing, she's either reading books, blogging at whoistheserialreader.blogspot.com, or watching eighties movies. Thanks for featuring my book on your site! Dawn of the Apocalypse does sound great! Gargoyle invasion sounds interesting!! Thanks fr sharing Kristin! I love gargoyles. Thanks. For the great giveaway.